An upfront sweet, fruity profile is layered with vinegar, molasses, Worcestershire, and mustard to give this blackberry sauce its barbecue stamp. 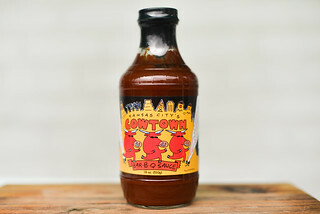 It was "Joe Joe's Hog Sauce" that started everything off for creator Joe Flanagan. 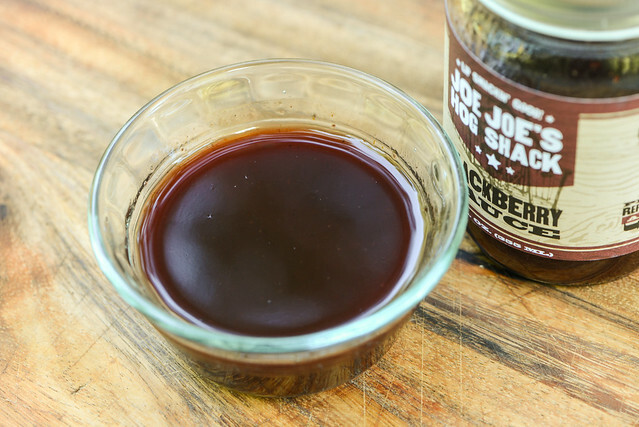 He had developed that North Carolina-style vinegar sauce to dress his smoked pork at family cookouts, but it wasn't long until he expanded out and created both a Sweet n' Tangy sauce along with this Blackberry Sauce as well. 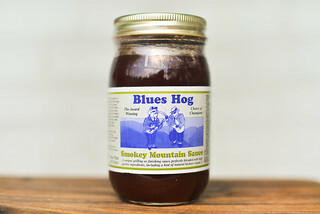 With three sauces now under his belt, Joe, with the assistance of his son-in-law, Brian Ellis, took the next step and began bottling and selling these sauces in small batches in early 2016 out their home base in Glenwood, Maryland. The first whiff of this sauce fills the nose with a prominent tart and very fruity aroma. The fruitiness has a distinct berry character, but that is matched pretty equally with a sweet tomato ketchup component. On subsequent, deeper smells, there's some standard barbecue complexity by way of a mellow molasses and Worcestershire sauce. There's also the faintest trace of smoke and chili sitting in the background, but the pepper brings along only an earthy character and no discernible heat. The color of this sauce is a bit hard to describe—it's a dark maroon, but with a purplish hue to it. The sauce is super smooth and glossy with a semi-transparent opacity which lets you make out some of the spices peppered throughout. It's consistancy runs medium-thin, with the sauce falling in a very fast, steady pour off a suspended spoon, slowing to quick drips, and ending with almost no sauce left clinging to the silverware. First taste of this sauce is pretty nondescript—there's a corn syrupy sweetness and not much else. As the sauce settles on the tongue though, that initial sweetness gains character by balanced fruity blackberry and tomato flavors, followed by molasses. This sugary, fruity profile persists as a mellow tang makes an entrance and then the slight tastes of Worcestershire and mustard. Finally the tartness gains a little more strength as a mild heat hits right at the end, leaving an aftertaste that's a mix of fruit, sugar, tang, and heat. This sauce had issues sticking the chicken, looking like it was sliding right off with each brushing. It was only after the third application that a visible layer of sauce gave the leg its bright orange color. Once moved to direct heat, that thin layer of sauce brunt almost instantly, creating large areas of char. The flavor did not fair that well, with the sauce primarily tasting sweet with a slight tang. This mellowness let the charred areas taste burnt, which was the most prominent characteristic of this chicken leg. In the past, I've been surprisingly attracted to a number of fruity sauces—surprising because these usually sweet sauces go against my personal preference for ones that focus more on heat. Added fruits can give a barbecue sauce a character that makes it really stand out and add great flavor to lighter meats like pork and chicken. 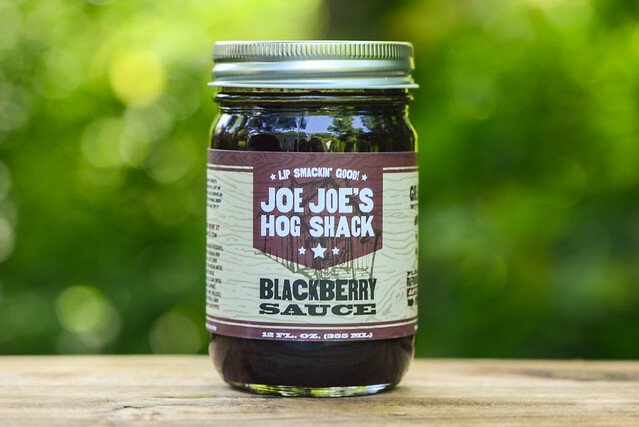 Unfortunately I didn't find Joe Joe's Hog Shack Blackberry Sauce one that would continue that trend for me. 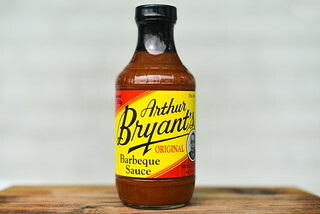 Out of the jar its profile was decent, probably a tad too sweet for my own tastes buds, but that strong sugary, fruity flavor had some balance with vinegar and depth by way of molasses and Worcestershire to give it a decent barbecue sauce profile. On the grill though, almost all of that was lost and I was left wondering, if it's not great for grilling, in what applications would I want to use it in its raw state. I could see it as a drip for fries or grilled pork chops, but even though it would fulfill on those uses, it wouldn't be the sauce I would first think of to play those roles. So while I can taste the quality and appreciate the layers of flavors, ultimately this sauce left more question marks than solid recommendations. Of course these reviews are just the thoughts of one person, and I'm sure this sauce can find a lot of love, starting with you! 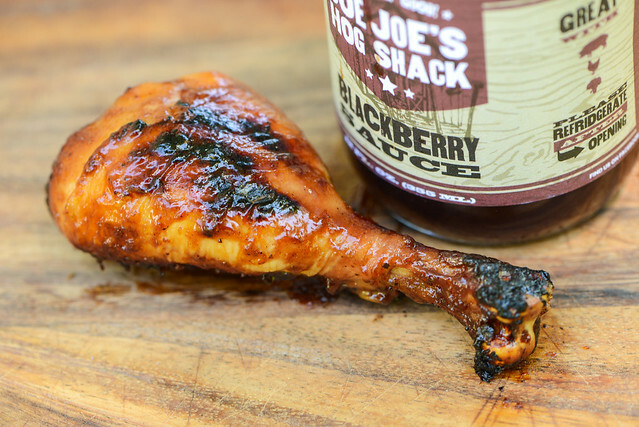 If you'd like to be entered to win a bottle of Joe Joe's Hog Shack Blackberry Sauce, all you have to do is comment on this post with your favorite fruit to grill or cook with. Deadline for entries is 11:59pm on Tuesday February 14, 2017. Read the official rules for more details. One entry only per individual. Good luck! I like using lemon. Very common, and quite possibly what one might consider boring, but it is good on ANY meat or vegetable, makes a great sauce or garnishment, and adds just the perfect touch of flavor to any dish. My favorite fruit to grill is local fresh nectarines when in season. I like to grill bananas and put them on ice cream, drizzled with caramel sauce.